step 1 - find "your 1"
But do you feel it? Yet very few people FEEL like they have (step 2). To me that is sad, not right. 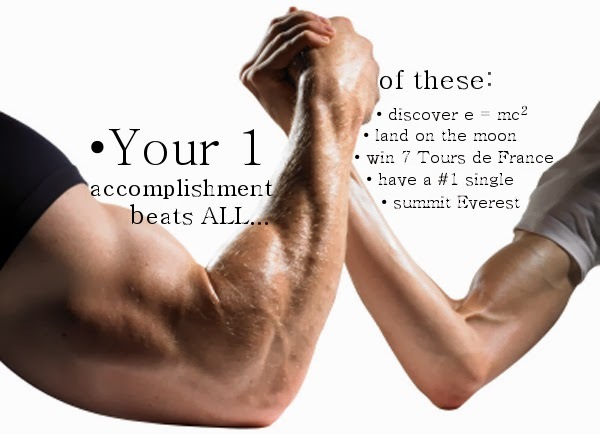 Especially given all the tremendous time and energy we spend over the course of our lives trying to win accomplishments (for ourselves and our children) that are so much smaller and ephemeral than even one of the items listed on the right. So, I don't know about you, but, if I absolutely knew that I had accomplished ONE thing that is greater than all of the items on the right combined---but somehow the feeling escaped me,---or, if there were times that I found myself feeling overshadowed by other people's accomplishments that are a far-cry less substantial than even one of those accomplishments I listed beside the puny arm---I would feel, cheated! (like I was cheating myself), and I would want to do something about it. Feel free to join me on this journey to know it, feel it and live it (step 3).